Cultured Grade A Pasteurized Fat Free Skim Milk, Fat Free Skim Milk, Nonfat Dry Milk, Salt, Guar Gum, Mono And Diglycerides, Xanthan Gum, Locust Bean Gum, Artificial Color, Vitamin A Palmitate, Acidophilus and Bifidum Cultures added. Each 1/2 c. serving is packed with 12 grams of protein, low in fat, calories and carbohydrates. 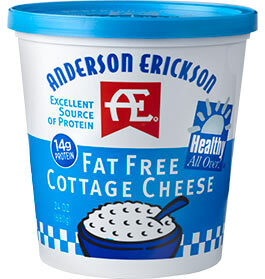 And, AE Cottage Cheese is gluten-free.